Playa d'en Bossa, Ibiza. These apartments form part of the famous Jet Complex and are just 300-metres from the beach in a quiet street and very close to all the exciting action of Playa d'en Bossa. Arlanza Jet Apartments - Close to the centre of Playa d'en Bossa with lots of bars and restaurants to choose from, the Arlanza Jet Apartments are just 300-metres away from both the main Jet Complex and its excellent facilities and the resort's broad sandy beach. Offering excellent value for money, these apartments are a firm favourite for couples and groups of friends who are looking for a quieter place to relax and sleep in peace after those long Ibiza nights out. 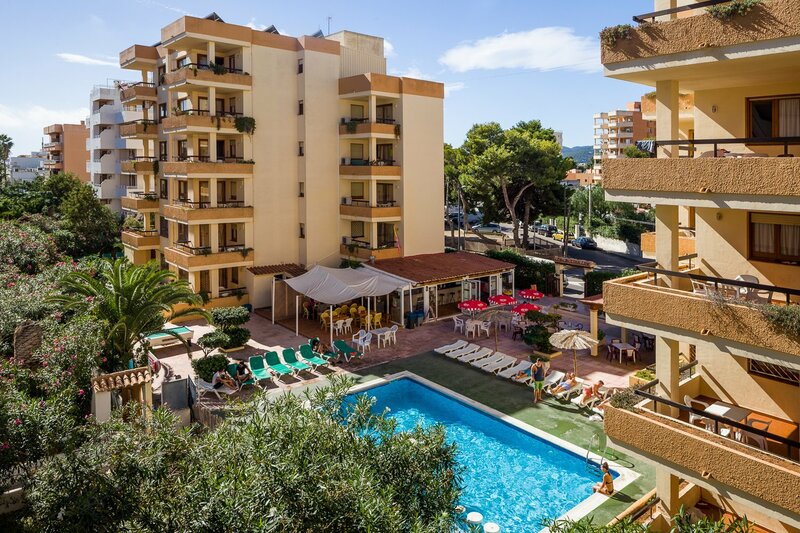 Within the Arlanza Jet Apartments, there's a pool, a well-sized terrace with sun loungers, and a popular bar serving snacks, meals and drinks from morning to evening. Guests also benefit from the fantastic facilities of the main Jet Complex that's right by the beach, where there are more pools, a fantastic choice of very popular bars and restaurants and a hairdresser with beauty salon to tame those locks for a day or night out. Choose from 1- or 2-bedroomed apartments - all offering plenty of space. All have air-conditioning, an American-style kitchenette, a lounge with eating area and a balcony for watching the world go by. The daily Jet Pool Party in the Jet Complex starting late afternoon is a must: it takes place right next to the beach, around the pool – or even in it! What could be better than dancing in the sun to the latest tunes played by local DJs? Night bars with LED screens play the latest dance music, where you will get a fantastic lively atmosphere. These bars are open from late afternoon until the early hours of the morning and make great spots to meet new people, watch live sports events, go for some pre-club drinks or even for a bit of a dance. The Arlanza Jet is situated in a quiet side street only 100 metres from the resort centre and only 300 metres from the beach, where you can find a wide choice of cool beach bars. The world famous clubs Ushuaia and Hi Ibiza are only a 10-minute walk away. The smaller and very popular club Sankeys is right around the corner and the infamous Bora Bora Beach Club is situated right next to the Jet Complex. All the island's clubs and its fascinating capital Ibiza Town can be reached by the all-night disco bus, whose route passes close to the Arlanza Jet Apartments. If you prefer to stay right where all the action is, why not try the modern 3 Star Ibiza Jet Apartments in the Jet Complex right by Playa d'en Bossa beach.